Thanksgiving is a favorite holiday because it’s all about spending time with family. 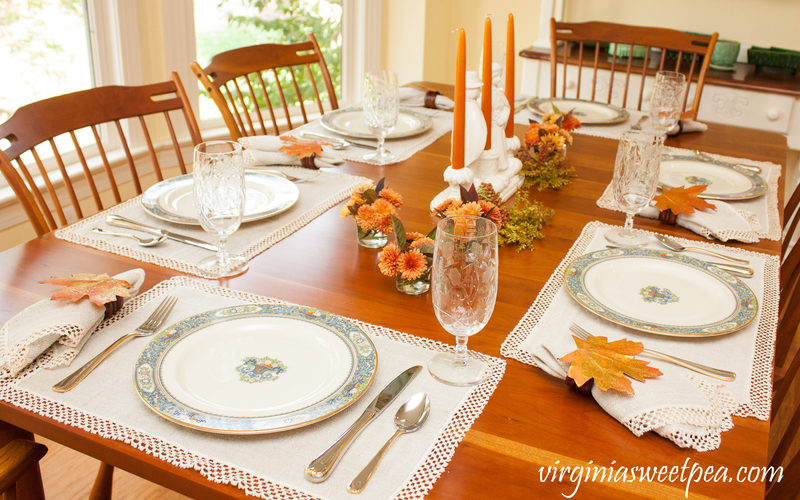 Gathering around the table to enjoy each other’s company with food prepared with love is the joy of Thanksgiving Day. 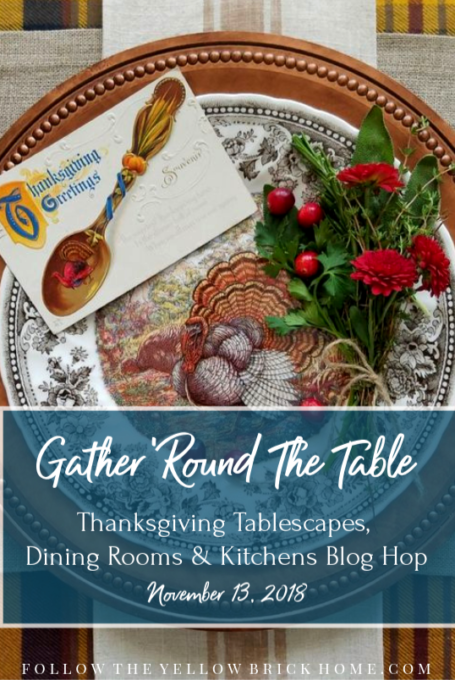 I’m sharing my Thanksgiving table decor along with a talented group of friends for a “Gather ‘Round the Table” Thanksgiving Blog Hop. 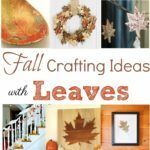 I am so excited to get ideas for decorating for Thanksgiving and I know that you will enjoy the ideas shared as well. 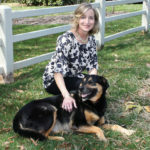 Many thanks to Amber of Follow the Yellow Brick Home for organizing this inspiring Thanksgiving tour. 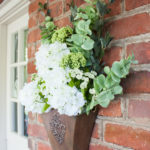 If you arrived here from Carol’s blog, Art and Sand, welcome! 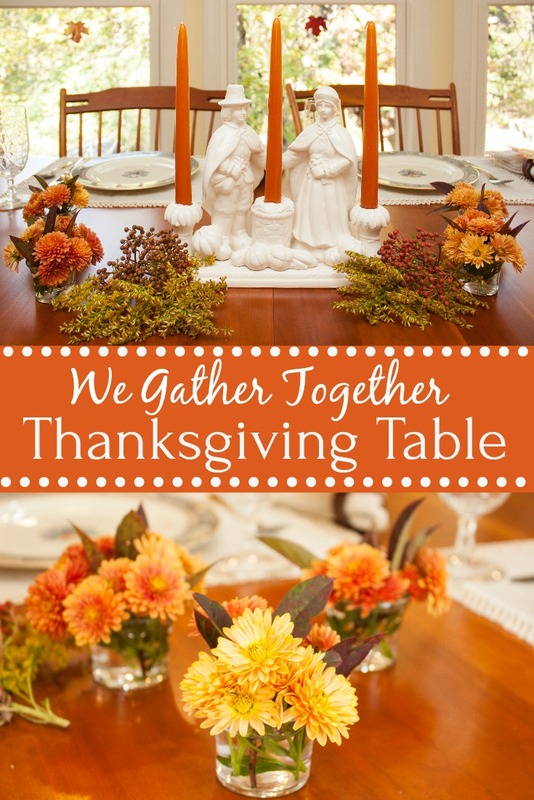 I’m naming my Thanksgiving table after my favorite Thanksgiving hymn, “We Gather Together”. Gathering together to celebrate and give thanks for our blessings is what Thanksgiving Day is all about. Setting a table for a holiday begins with the table centerpiece. I purchased this vintage pilgrim candle holder at a local vintage shop where I used to have a booth. I saw it on one visit, couldn’t stop thinking about it, and bought it on my next visit. 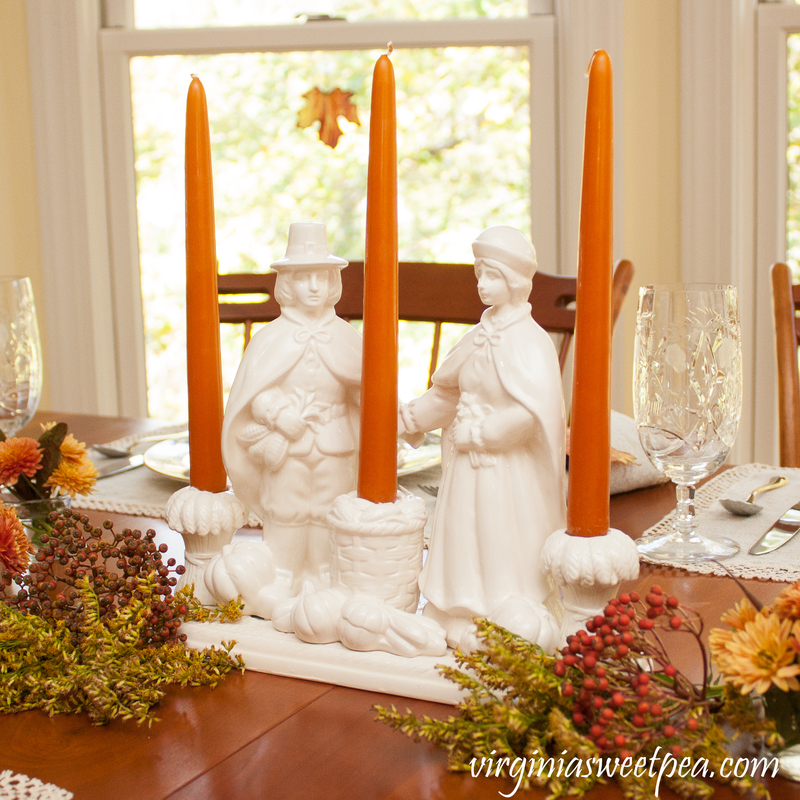 This year I used orange candles that contrast nicely with the cream colored pilgrims. The orange coordinates with the flowers that I used and also with my china. Growing up we usually went to my grandmother’s house for Thanksgiving. 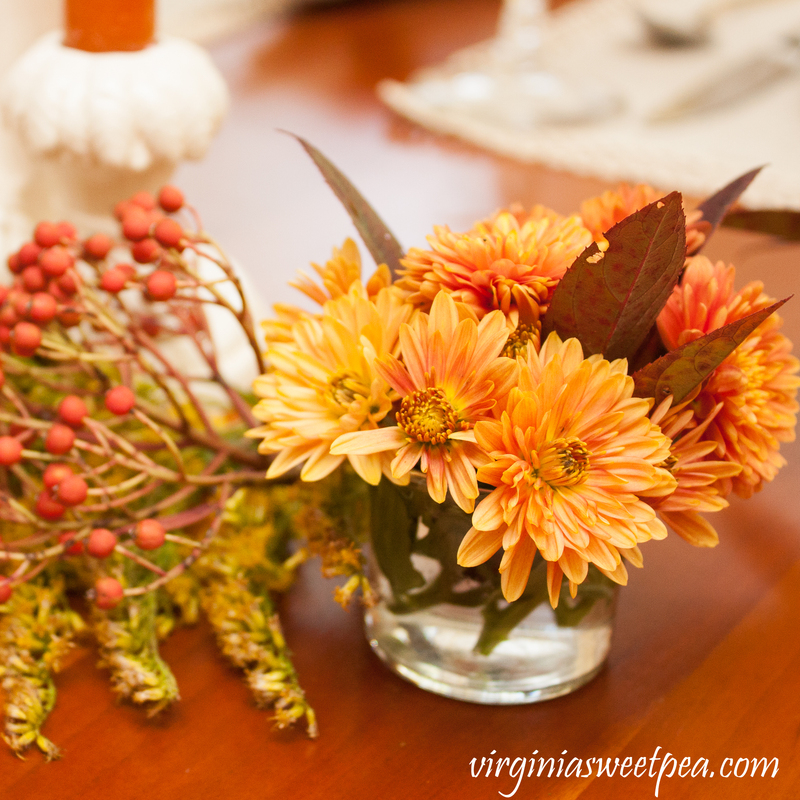 Granny was a talented floral designer and created the most beautiful centerpieces with a cornucopia filled with fruit and surrounded by fall flowers and pilgrims. 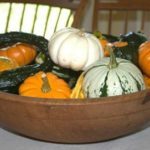 My mother now hosts Thanksgiving and she also creates a pretty centerpiece each year. 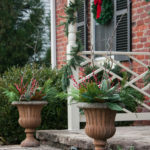 The flowers, greenery, and berries that I used are from my yard or from the yards of my neighbors. 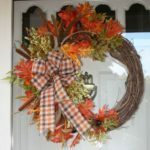 When Thanksgiving finally arrives, I’m hoping that my mums will still be alive and not killed by a heavy frost. For my Thanksgiving table I used my wedding china, Lenox Autumn, that I picked out in the 1980’s when I was still in high school. Every shopping trip to the mall with my mom included a visit to the china department of then Leggett. Mama and I would admire the china and I picked out this pattern years and years before I met my husband. 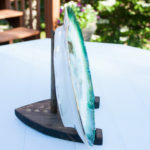 The table is also set with my wedding silverware, Gorham Golden Ribbon Edge. My crystal belonged to my great-great aunt, then my grandmother. It’s pattern is one that I’ve never seen when I browse in antique shops. My placemats and napkins also belonged to my grandmother. Wired and preserved leaves brushed with gold add a fall touch to wooden napkin rings. I set this table in our breakfast room which adjoins our family room. 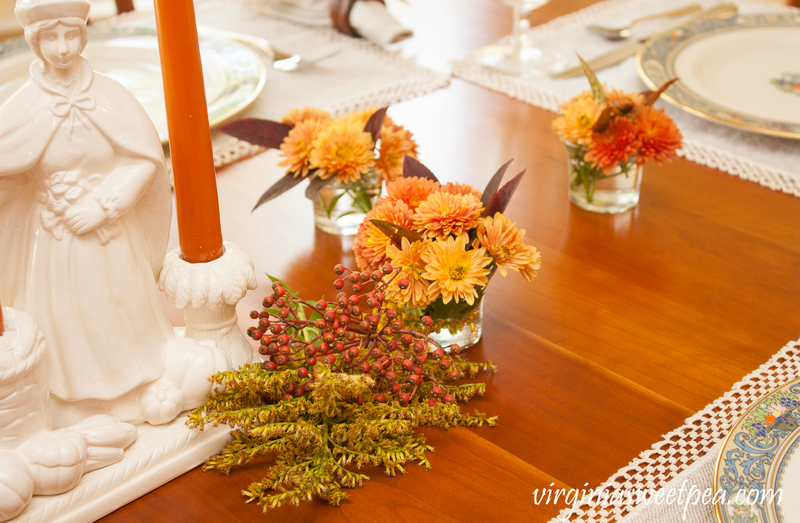 You can see the family room fall decor here. A few days after I took these pictures, I had a group of friends over for a chili night. 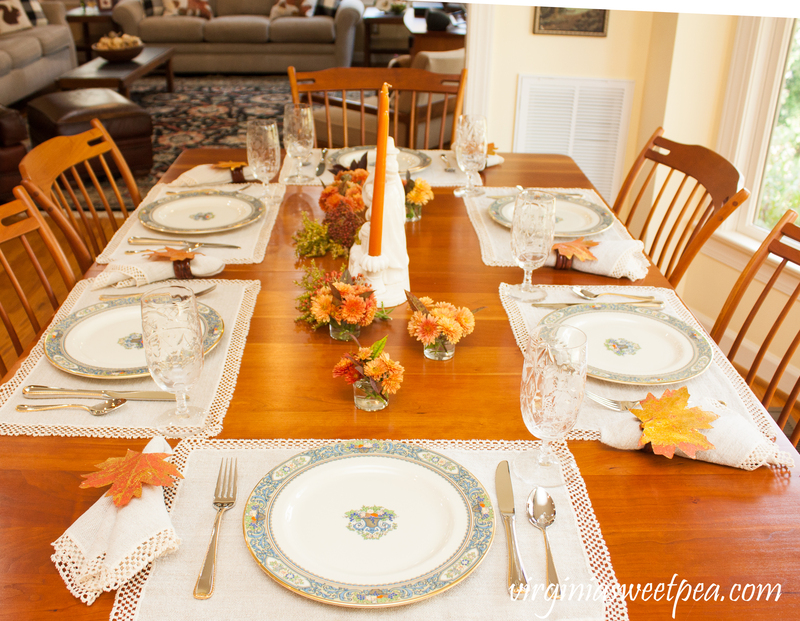 I switched the placemats to “everyday” mats printed with leaves and used my more casual dishes, Mikasa Autumn Harvest. Beside the pilgrims I used Goldenrod from my neighbor’s yard and berries from a mystery plant. If you know what plant produces these berries, please educate me! The blooms are all from the same plant. In some areas the blooms were a light rust color and in other area a dark yellow. Don’t think that you have to buy flowers for your table. 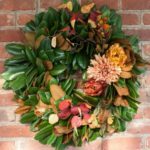 A quick scan of your yard or the yards of your neighbors just might yield what you need to decorate your Thanksgiving table. I would love it if you would pin this post for others to enjoy. Next on the tour is Debbee’s Buzz. 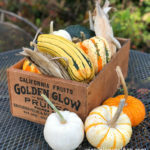 Visit my friends below for more Thanksgiving decoration inspiration! Paula, your table is beautiful! Mikasa Autumn Harvest has long been one of my favorite patterns. My mom has that pattern with many of the extra pieces too. It’s so pretty and timeless. Love your placemats too. Everything about this table gives me all the Thanksgiving feels. 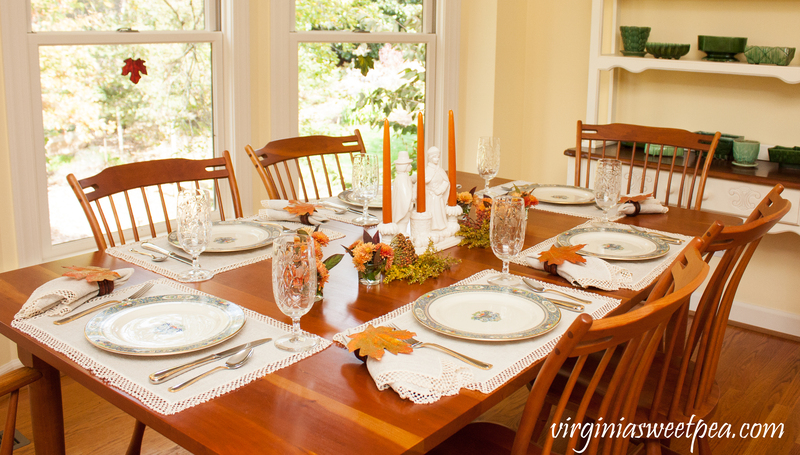 The orange and white just pops and the whole table makes my vintage-loving-Thanksgiving-loving heart go “pitter-patter!” Those dishes are some of the most beautiful I have seen, although I have never actually seen that pattern in real life. I hope you have a beautiful Thanksgiving! Thanks for hopping with us! I love your table, Paula! 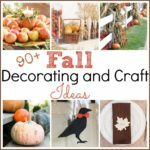 The colors are perfect for fall and I love that you decorated it with meaningful pieces! What a pretty table! 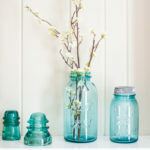 I adore the mini vases of mums. Your table is lovely. I love the centerpiece. I love the colors on your table. Very pretty! Paula, I came soooo close to picking the same Lenox china pattern! I loved the richness and colors, but then-future hubby preferred my other choice (Lenox Eclipse). As a plate addict, I wish I had both! Your pilgrim candle holder is really special. What a great find! 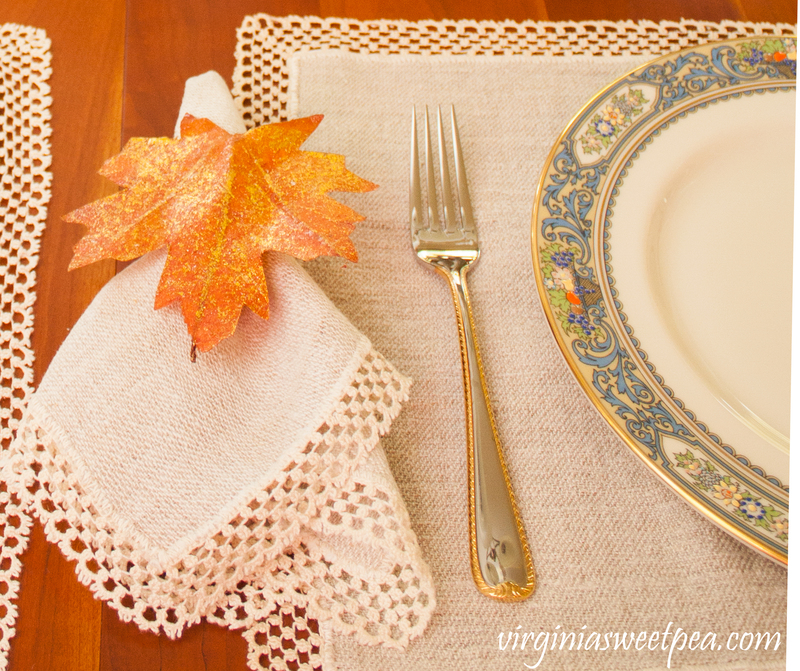 A festive, inviting table…and hard one to follow on the blog hop LOL! Your Lenox is gorgeous. I have the same pattern and will probably end up using it on one of our tables this holiday season. The pilgrim candelabra is wonderful. Isn’t it fun that we have the same china pattern? I don’t use mine nearly as much as I should. Beautiful! I am thankful for you! I am thankful for you as well! Paual, What a beautiful table but I think what I enjoyed most was you sharing such wonderful memories, traditions and how you picked out your wedding china! So glad you got those candle holders!!! Lovely table! 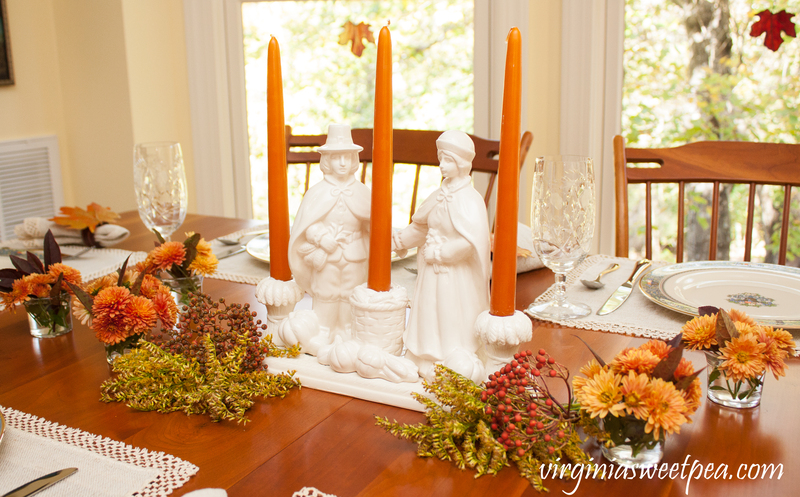 The vingate Pilgrim candle holder is a perfect centerpiece. I’ve never seen one like it. Hope you and your family enjoy a beautiful Thanksgiving! Thank you, Sarah! I hope that you have a wonderful Thanksgiving as well. 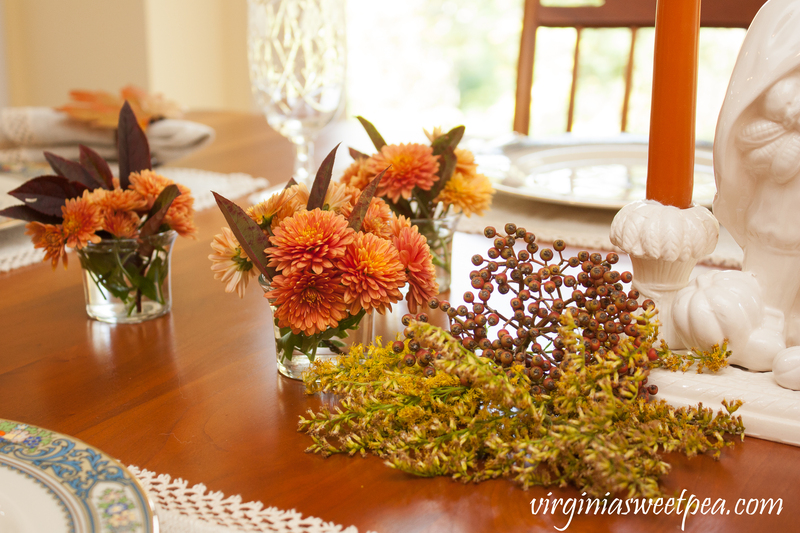 Your Thanksgiving table reminds me so much of how my late mother would set hers. She used a couple similar to your candleholder. Your Lenox Autumn china is the pattern I wanted for my china, but my mother talked me out of it. I still love that pattern. PS I had a hard time staying on your site, A pop up box repeatedly showed up saying the site was unresponsive. Thank you for letting me know about my site being unresponsive. I’m sorry that happened to you. I don’t use my Lenox Autumn nearly enough. 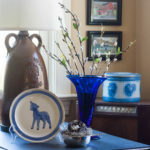 I really should start using it day to day and enjoy it rather than just displaying it in my china cabinet. You picked out your dishes before you picked out your husband, Paula? You are my kind of lady! LOL. 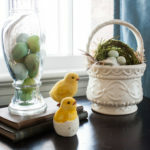 I guess my fruit laden cornucopia centerpiece would have been right up your Grandma’s ally;) I think we are both sentimental, vintage lovers; everything has a memory attached:)Fun to be hopping with you, friend! Have a wonderful Thanksgiving! Hey Paula! 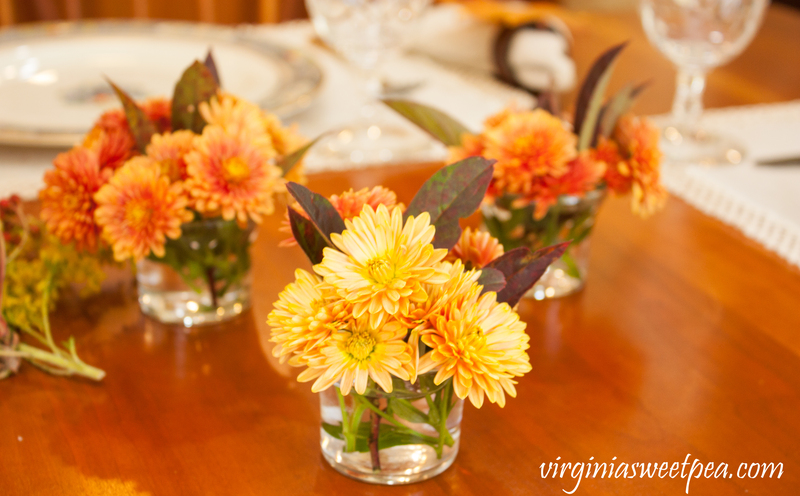 I love your tablescape with that gorgeous candle holder centerpiece and the pretty mums. I love that you used orange candles in the centerpiece to give it a little added pop. 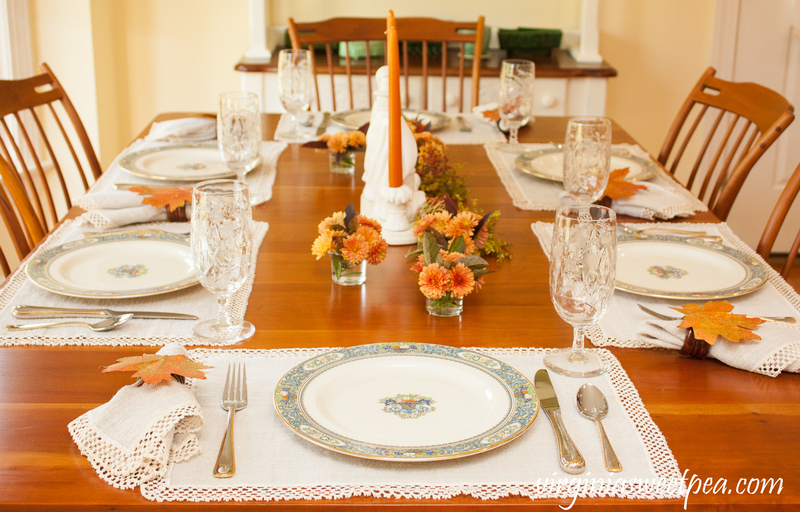 The coordinating plates and silverware are lovely and adding a fall leaf on top of every napkin is a nice finishing touch. So happy to be hopping with you! Oh so beautiful. 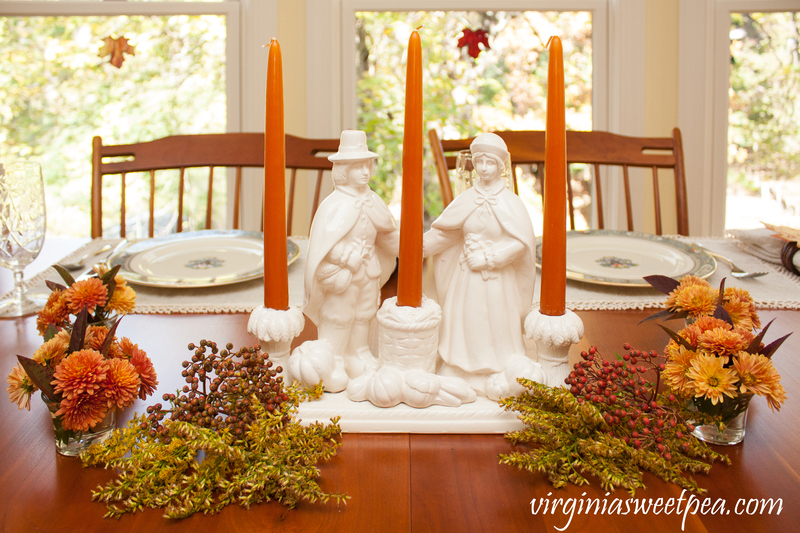 I love the autumn colors and your pilgrim candle holder is stunning, such a treasure. I love a simple table that celebrates the season perfectly and yours does. 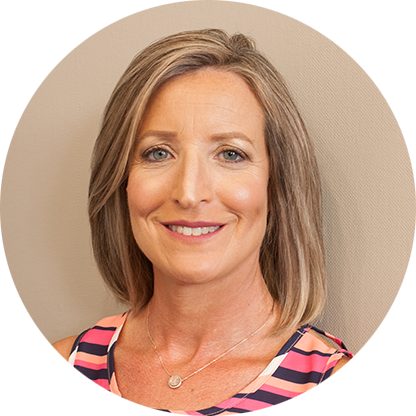 Thank you, Laura! I hope that you have a wonderful Thanksgiving as well. I love your beautiful wedding china and it goes so well with the colors of Fall. I do like your pilgrim centerpiece too! Wishing you a Happy Thanksgiving! This is the most perfect Thanksgiving table! Everything looks just gorgeous from the pretty china to the flowers, and adorable vintage candle holder. I hope that you have a very Happy Thanksgiving!! !